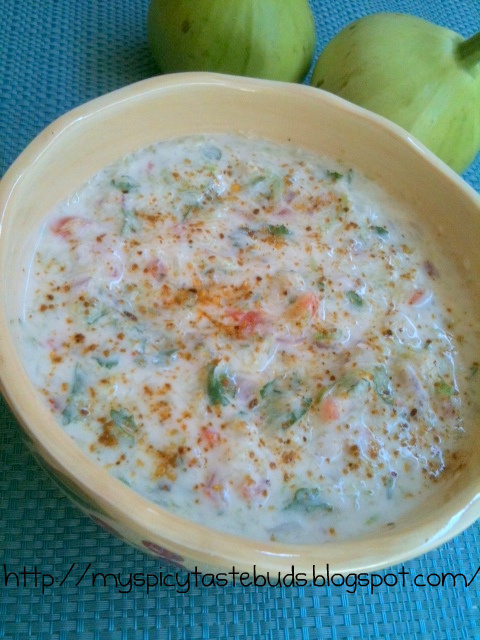 My ami used to make this raita very often during summer season. It is believed to have cooling effect on body during the hot summer days. This recipe is something which will always remind me of my sweet maa je and her love and care for us. Now when I look back, I realise how much my mother loved us and how much effort she had put in our upbringing. I still get amazed at how she managed every thing so perfectly with 5 kids. She was a really hard working woman, who spent all her time, energy and love taking care of her family and house. She was a great cook, and every body in friends and family loved her cooking and hospitality. It's been 4 long years since she left this world but I can still feel her in every single thing around the house. So coming back to the recipe, although we have always used round bottle gourds but you can also use the long ones too, choice of adding tomatoes and onions in entirely up to you. you can have it on it's own or serve it along with dal, sabzi, or meaty dishes too. Here's how ami used to make it…. 1) Peel and great the bottle gourd. Boil it in 1cup of water for 5 minutes. Drain out the water and keep aside to cool down. 2) Slightly whisk the yogurt until well blended, squeeze out the water from the boiled bottle gourd. Mix every thing in a bowl and it’s done, ready to be served.